Let’s say you’re heading off to work this morning in your SUV. You’re driving along the highway and you’re approaching an intersection. The traffic lights are currently showing green but now they change to yellow. What are the decisions you will need to make and how do you go about making them? Your choices are simple. You can either stop at the intersection or you can go through the intersection before the lights change to red. 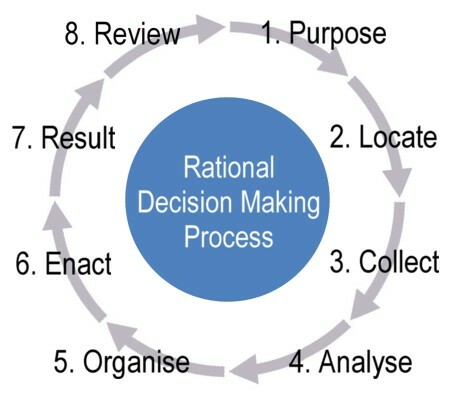 The rational decision-making process is made up of a series of stages. You have a purpose – to get to work safely and on time. To achieve this while driving means you have to know where to locate the information you need – in this instance, the traffic lights. You see the signal change from green to yellow – in other words you collect or sense this information through your eyes. You next organise your response by considering such factors as the distance to the intersection, the speed you’re travelling, the road conditions, the actions of the vehicles in front and perhaps the large truck right behind. Finally you make a decision to brake before the intersection. In your external world you enact your decision by planting your foot on the brake pedal. The result is you’ve stopped at the intersection as the traffic light turns red. You might review this as a satisfactory result. Most times as experienced drivers we go through this process without consciously thinking about these phases of decision making. In actual fact, an experienced driver will recognise a certain pattern of factors will lead to one form or action or the other. One pattern leads to a known action script, for example continuing through the intersection. A different pattern of factors leads to a different action script – stopping at the traffic lights. On this basis there is no weighing up of alternatives taking place. This is the way military personnel are taught decision making using intuition. But it takes experience. Research psychologist, Dr Gary Klein, defines intuition as “the way we translate our experience into action.” In his studies of the decisions firefighters need to make when confronted with confusion and uncertainty in fighting a fire he was surprised to find they didn’t spend time consciously analysing situations and choosing alternatives, they just acted on intuition. Also, these phases are continuously updated since you are don’t stop collecting information. Some suggest we may make 30,000 pattern-based, intuitive decisions in the course of a day. Klein suggests that 95 percent of our decisions are based on experience and intuition. But without experience relying on intuition can be problematic. However, Klein recommends even in these cases to starting with intuition – the ‘gut’ fell for what is right – and then proceed with the classical model. There is a danger here that the first solution will be defended and the decision maker blindsided to rationally considering other alternatives. Other decision making researchers have long recognized that in the real world many people do not follow what the theory says they should be doing. People can be blindsided by emotions and prejudice. They can be easily overwhelmed by complexity. They make errors in analysis. Decision theorist Howard Raiffa suggests a modified theory is required – one that includes the human dimensions that make or break decision making. What follows is my proposal to include the relational domain as an addition to the rational domain. Fundamentally, a business revolves around the decisions made by people. These decisions range from the micro daily tasks such as what emails to answer and who to call next to the difficult human focused decisions on who to hire and who to let go to the macro and strategic decisions on what products to launch and when. With events that may occur, such as occupational health and safety issues, there are set procedures to follow when they occur. These are called programmed decisions. 1: Purpose – identify the outcomes to be achieved. What is the decision to be made or the problem to be solved? 2: Locate sources of information. What are possible sources of information, internal and external to the business, and from human and systems sources? 3: Collect relevant information. Obtain the data from systems sources and either interview or obtain inputs from relevant people. 4: Analyse information. There are numerous tools to assist analysis depending on the task. These range from big data analysis tools, to SWOT analysis, to decision tables. 5: Organise a response. Develop conclusions from the analysis. Weigh up the options. Make the decision or form recommendations to the final decision maker. 6: Enact – take action. Present the report to the final decision maker if appropriate. 7: Result of action. Monitor what’s happening. Watch for unintended consequences of the action. 8: Review result of action and approach taken. Take corrective action if necessary even if it means starting at Number 1 again. As individuals we live in two worlds: our hidden internal world made up of our depictions, interpretations, impressions, emotions, and experiences of the real world – and the external world of events, announcements, directives, stories and our own responses and activities in the real world. 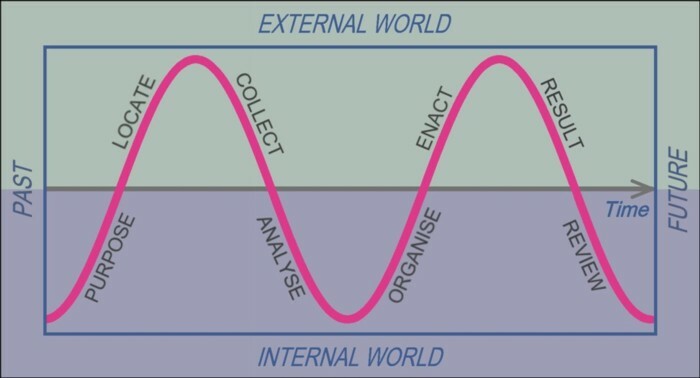 We can see from Figure 2 that four phases of the decision-making process occur in one’s internal world and four occur in the external world. This time-based rational decision-making model can be used in three ways: for learning, for problem solving, or for intelligence gathering. In problem solving we generally focus on the current situation using information management and analysis skills to try to find an answer to current problems, such as in the Apollo 13 flight to the Moon, “Houston, we’ve had a problem!”. Over the life of a major project, for example commercialising a product, many decisions must be made and therefore many decision loops will need to be completed. The faster one proceeds through successive decision loops without delays occurring, the more efficient and effective one becomes. It has also been shown that a competitive advantage is established if an individual or a team can proceed through successive decision loops at a faster rate than a competitor. It’s not the absolute speed as much as the relative speed. After all, a racehorse only needs to have a nose in front to win a race. For example, when Northrop and General Dynamics were vying to be selected as the prime contractor for the Air Combat Fighter project for the US Air Force, it was the ability to get through decision cycles at faster rate that led to General Dynamics winning the $40 billion contract. The General Dynamics Chief Designer, Harry Hillaker, said later, “One of the reasons the Air Force eventually chose our design was that it was closer to a full-scale development than Northrop’s.”4 In other words, they had completed their decision loops at a faster rate than their competitor. Similarly, the project to map the human genome was expected to take ten years and cost billions of dollars. Instead, Craig Venter led a small team and used advanced technology to accomplish the task in less than a year for a cost of $500 million. Apple are also skilled at beating the competition by keeping their developments secret and only releasing news of products when they become available. This means that Apple can achieve a time advantage over competitors. Posted in can-do wisdom and tagged decision making, decision making model, decision making process, problem solving, rational decision making, rational decision making process.